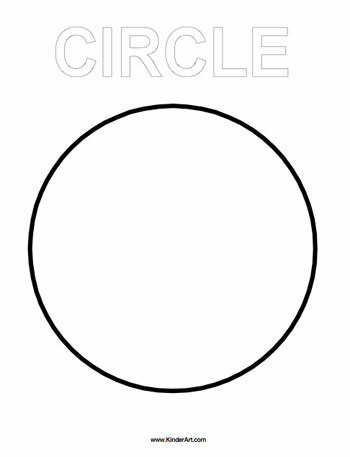 This next picture can be a good exercise for your kid to practice how to draw a circle. Your child must be playing with toy cars and must have seen racing cars on television. This car will catch his attention, and he will love coloring it. Ask him to recognize the shapes that are hidden in this picture. This shape hunt game is a great way to make your child think and find out the answer himself. Appreciate him if he gives the correct answer. This picture is excellent when trying to register the basic shape in your kid’s mind.The two lines can also help your kid understand the concept of a circle within a circle. Can you spot the different shapes that make up this tug boat? Ask your child to spot the different shapes like semi-circle, cylinder, squares, rectangle, and tiny triangles. If your child can spot all the shapes correctly, then you should give him a treat! Your child will also enjoy coloring this little tug boat with smoke billowing from its tall chimney. The first thought that comes to one’s mind that heart stands for love. Yes it does, at the same time it is a name of a shape. In this picture, the outline of the heart shape is trimmed with semi-circular pattern that makes it look like a lace frill. This geometric pattern is a combination of many shapes, mainly triangles. Ask your child to find out different shapes from this geometric pattern and color them. Also ask him to count the number of similar shapes found in this pattern. We know you want to keep your kid away from junk food. This yummy-looking pizza is another perfect example of the shape circle (and he cannot eat it!). This is for older kids who have been coloring for a long time. It is a complex pattern made of small curved lines and sections of circles. The spaces between the lines can be filled up with various colors to make a really interesting image. It is best to start with the very basic shapes, isolated from each other, so that your little one does not have to worry about coloring within the lines. Let them discover the joy of producing color on white paper with these shapes before moving on to actual, meaningful images made with shapes. It is not easy to explain the difference between circles and ovals to small children. 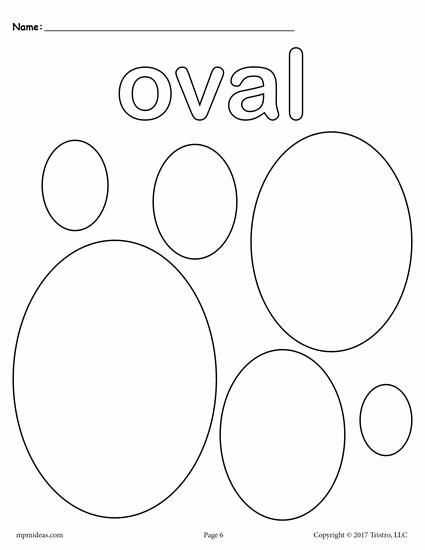 This picture will help your child understand the difference between circles and ovals easily. This funny face has oval shaped eyes, nose and ears. Even the hair, mouth and neck are comprised of oval shapes. 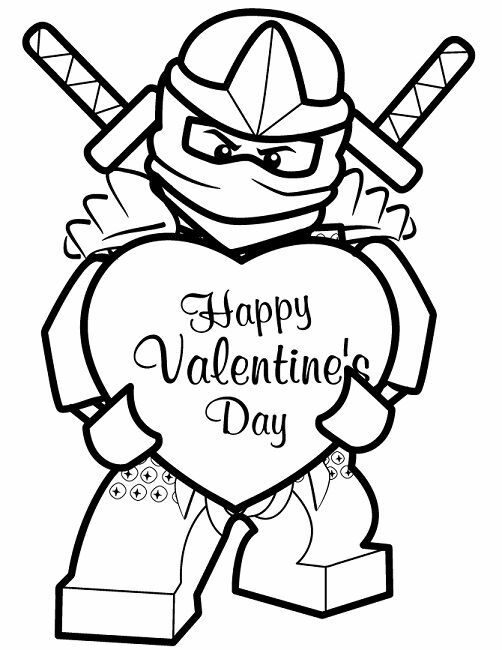 This picture is sure to make your child giggle as he colors it. You can guide your child to color this picture correctly and make it look even funnier. 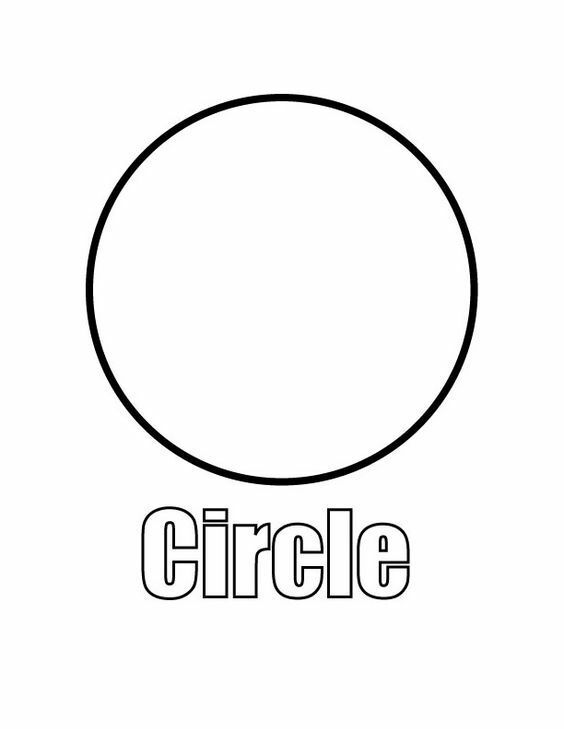 Once again, use this next picture to spot and color the shape circle. You can gradually introduce other shapes to your kid. This is a cute little outline drawing of two planets, one of which has a smiley face and the other looks strangely like Saturn, a galactic swirl, two stars, and alien ship- a flying saucer to be exact- and a small space-ship. Good choice for your budding astronaut! This first picture is the best one to start with. The thick outlines will help your kid color well. In this picture we see a cat flying a kite in front of his house. The house is three tiered and has three roofs. There are many doors and windows which are made up of different shapes like squares and rectangles. There is a fence in the background. Learning shapes is important in a lot of ways. This knowledge is often applied in varied areas of one’s curriculum. So we have put together top 10 circle coloring pages for your kid. This picture consists of a lopsided man’s face with a hat and mouth made of rectangles, a nose made of a triangle and the eyes, face and ears made of circles. This colouring page is perfect for little kids who have had a little practice with shapes. When a kid starts learning, schools first teach about shapes and colors, even before numbers and alphabets. Shapes and colors are much easier to notice in the world around us. It helps and encourages a kid to actually identify and even organize the world around him. If you have a young child of 3 to 4 and want to introduce them to coloring, you need to start with the very basic shapes. This allows a wider margin of error. If the colors spill out of the lines, the whole picture does not look haphazard, so you don’t have to worry about your child becoming demotivated. Simply download these images and print them. These, along a first crayon box, can make for a great first coloring kit. Use this picture as a spot and color game. Tell your kid more about volley ball game. So here are top 10 circle coloring sheets to help your kid identify circles better. Making your toddler begin by coloring shapes, is perhaps the best way for you to introduce both colors and shapes to him or her. And if you thought coloring shapes was mundane, think again, for there are several printable designs that integrate different shapes, which allow your child to use a whole palette of colors while learning what shape the objects are made up of. If you are thinking of teaching your kid about shadows and how light affects the colors, this is a good start. These 3D images can be colored keeping the light source and its visual effect in mind. This picture is appropriate for slightly older kids. Also, make sure you child has practiced coloring 2D shapes before venturing in 3D shapes. No party is complete without party hats, candies and party horns. The objects shown in this picture are made up of different shapes like candies are oval, the party horn is cone shaped and the party hat is triangle shaped. Let your child find out the shapes hidden in the picture and enjoy coloring these party goodies. Help your child identify how the mistletoe of Christmas too is in the shape of a circle.While your kid enjoys coloring this picture, talk to him about Christmas festival and its traditions. When your kid starts learning about patterns and shapes, always use examples from things that we encounter in our daily lives. It helps them categorize or differentiate things better. Using the circle coloring pages, you can teach your kid about numbers, small and big comparison, sports, food habits, sun, festivals, shapes and a host of other things. Your child need not color the heart red; he can use his imagination to color the heart and the frills. You can show him how a beetle leaf looks like, so that the he understands the meaning of heart shape. You can show your child the picture of a diamond and also tell him where you can find diamonds. He will be able to understand how this shape has derived.You can also show him different objects and logos, which have a diamond shape, so that your child can understand this concept better. Our very own Sun God too is circle in shape. Teach your kid about what Sun god really means. Get your kid eager about coloring circles. Always include things from the walks of life while introducing your kid to something new. This happy looking robot is also composed of basic shapes as well. However, the shapes are actually quite small, so only try this if your kid has had some practice with colouring or the small buttons and slots of the robot may be blurred over by crayons’ thick strokes. This is a simple diamond shape that your child will like coloring. Just notice what color he uses to make the diamond shape look bright and colorful. Also ask him to color the word diamond, so that he remembers the name of this particular shape. These free printable shapes coloring pages mentioned above are both interesting and educative. Your children can learn a lot about coloring and drawing by filling the relatively complex images with colors. Happy Coloring! Knowledge of shapes can be really empowering for your kid. It helps him familiarize and find a connection between things. For instance, if you tell your kid that his cereal is circle in shape, he will find it amusing and eat more of it out of same amusement. You can show him more pictures of caterpillars and their natural habitat. Make sure your child colors the caterpillar green. Through this page you can teach your child about shapes, numbers and nature. So spend some quality time with your child while coloring this page. You can ask your child to draw some leaves and trees in the background to make the picture look realistic. Next time you go to park do some caterpillar spotting with a magnifying glass. It is a great way to introduce your child to nature’s little creatures they should know about. This image constitutes of only squares and triangle arranged side by side to make an intricate pattern. If all the spaces are filled with different colors, it can put a kaleidoscope to shame! This is a very unique shaped racing car that will make your child instantly curious. This car looks like a racing car, since it has number one written on it. The body of the car is triangular but the tiers are circular in shape. There is a small seat and may be a triangular flag at the back of the car. Every little child dreams of becoming a prince or a princess and live in a castle. So coloring this picture of a castle, composed solely out of rectangles and triangles and trapezium is going to be very enjoyable and quite easy too. If your child has been coloring isolated shapes for a couple of days, it is time to switch to something more meaningful or they would become uninterested. This is a great coloring page to start with because even though the shapes have a meaning; they are not too close, which will minimize color overlapping. Here are the top 20 fun and simple Shapes coloring pages printable to color and to engage your child’s interest. Also help your child to spot different objects in his surrounding and tell the different shapes. Innovation is the trick to make new concept clear in children’s minds. Games and coloring pages helps to make learning really enjoyable and interesting! Coloring not only nurtures the imagination but improves the child’s cognitive skills, the power of decision makingand eye and hand coordination. These coloring pages will certainly make learning shapes easier. Next time when you ask your child about shapes, he can tell you the names of all the shapes. So print the pages and have fun coloring with your kid. The diagonal stripes on the party hat and horn will make coloring more fun. You can guide your child to add some balloons, glitters, masks and confetti in the background to make the picture complete. This picture shows other shapes and it will help your kid get a little familiar with other shapes.Ask your kid to spot circle of all first, and color it before others. Do teach him names of other shapes. Donuts are not always bad for your kid. Your kid will be thrilled to color his favourite dessert or confectionery. Teach your kid about what toppings mean and help him spot the small circles in the picture that denotes toppings.Next time your kid eats pizza, he sure will recollect its shape being circle. This image is that of a night-time scenery. So if your child wants to draw something interesting than mere shapes, this image is perfect as the level of difficulty of colouring is moderate. The stars, crescent moon, tree and the house itself are composed of basic shapes of rectangle, triangle and circle. The next picture is Diwali special. This picture has a lot of small circles in it. If your kid loves balloons, he would enjoy coloring this picture. He will now know the concept of singular and plural. Ask your kid to join the dotted lines and complete circles. This can help him learn drawing a circle free hand.Your kid can actually color every circle differently and add some colors to the pictures. How many circles are present in the caterpillar’s body? Coloring this smiling caterpillar will help your child become more familiar with smaller circles. Ask your child to find out the different shapes and spell it out loudly, so that he remembers them. He will especially enjoy coloring the cat and the kite. He will use his favorite shades to color this house and the kite, his imagination will make this page even more colorful. Pin up this page in his room so that he remembers the names of all the shapes. You can also ask him to label the names of the different shapes on the page. 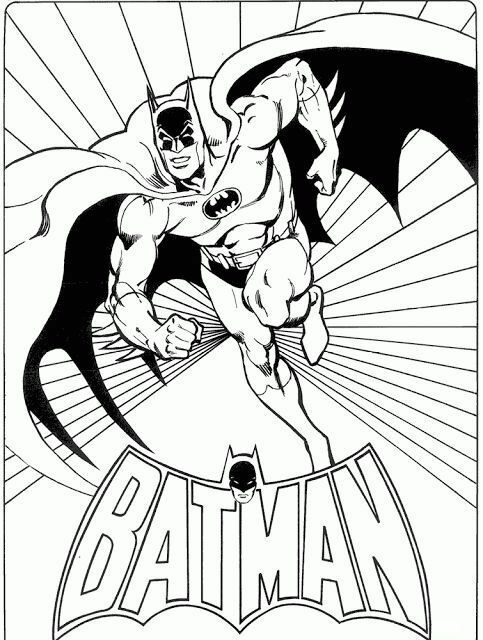 This coloring page can be effectively used as a learning tool. Since, innovative techniques make learning easier and fun at the same time. We hope you liked our collation of free printable circle coloring page. Please share your feedback and your kid’s work with us. Your child will have great fun counting the number of shapes and spotting different shapes. Also you will be able to understand whether your child is able to remember the numbers and shapes you taught him before. If your child is finding it difficult to remember different shapes, then this page will help him to learn the shapes while coloring it. Learning can be fun if the content is presented in an interesting way. Let your kid use his creativity and color these balloons in different colors.The next time your kid buys a balloon, do remind him the shape of his balloon is circle. Your child’s creativity will make this flower in the pot look even more beautiful. Use this page as a poster or file it up and use it as a study material for future. This coloring will develop your child’s interest in art and help him to learn the fundamentals in a more comprehensible way. Guide your child to label each shape and say it aloud so that he remembers the name of the shapes. This simple picture of flower in the pot is a great way to start teaching shapes to your little one. This coloring page is the ideal study material for your child to learn the basic shapes like circle, oval, triangle and square. You can also show your child some pictures to show how a real tug boat looks like.